Hamilton-based composer and multi-instrumentalist Edgardo Moreno has been commissioned for projects in Canada, Venezuela, Mexico, Sweden, Argentina, England and the USA. He has written scores for films produced by CBC, Bravo, City TV, NFB, OMNI, the Ontario Arts Council, the History Channel, and TVO, and has worked extensively with choreographer Allen Kaeja’s Toronto dance company, creating sound design and musical scores. Edgardo recently premiered his solo multimedia Firefly Project, a performance experience that blends visual poetry, storytelling, and music inspired by Latin America. 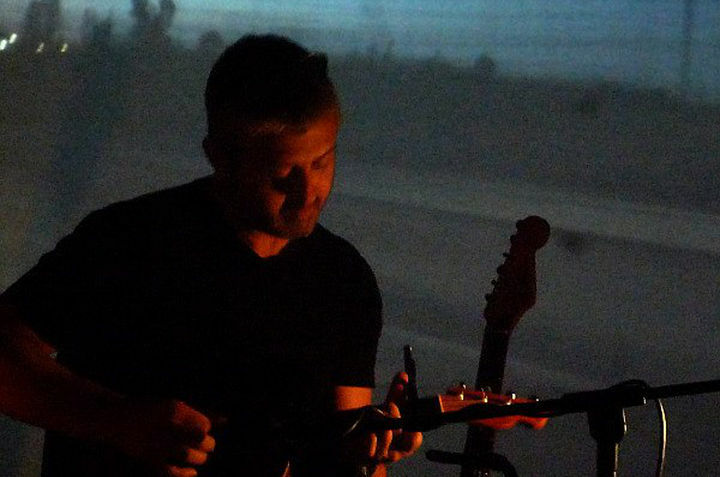 The powerful ambience of drama and suspense that he brings to his film and video scores can be heard in his solo performance for guitar and electronics, merging the prearranged with the improvised to create the totally unexpected. “Hope Cries For Justice” brings music, words and movement together for open hearts and minds. The artists wish that we imagine a more compassionate world. That we envision a world we want to live in. That we join the performers and embrace creativity in order to find hope in a difficult time. “Hope Cries For Justice” is collaboration of dancer Patricia Nicholson and multi-instrumentalist William Parker that they describe as “a creative response to the current assault on justice.” This special performance will also include visual artist William Mazza, who also works with Nicholson in a project they call Revolution Resurrection. Nicholson is a powerful performer rooted in the aesthetic of free jazz and whose practice involves movement and spoken word. She has collaborated with Parker, Billy Bang, Matthew Shipp and many others. In addition to founding and directing Arts for Art and the Vision Festival, she initiated and runs Artists for a Free World, a New York City-based creative group focused on active and ongoing political resistance through public performance. With Parker, Nicholson has a collaborator who has been a key figure in the creative music world since the 1970s.Parker was an important member of the Cecil Taylor Unit, in addition to work with Peter Brötzmann, Milford Graves, Billy Bang, Roy Campbell and David S. Ware, among many others. And Brooklyn-based Mazza is a visual artist and activist, whose work explores the spatial and temporal relationships of people to their natural and mediated environments. Five decades ago some of the most important thinkers and musicians in the future history of creative music gathered on the South Side of Chicago to chart a new path of self-determination. The Association for the Advancement of Creative Musicians (AACM) was formed to allow a core group of visionaries to present original music without the impediments of the local jazz business. An all-star trio of recent AACM members has formed to celebrate that legacy during its 50th anniversary. 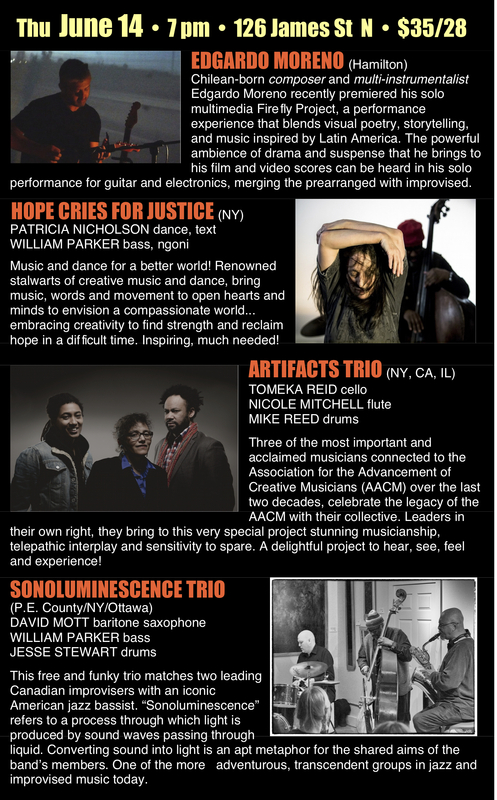 Cellist Tomeka Reid, flutist Nicole Mitchell, and drummer Mike Reed – three of the most important and acclaimed musicians connected to the AACM over the last two decades – recognized the value of taking a look at the AACM’s rich history for their new collective trio, which Tomeka Reid conceived for a concert in Seattle early in 2015. The audience spontaneously gave Sonoluminescence a standing ovation when they last played in Hamilton in a 2016 Sunday concert at the AGH. And no wonder: not only is each member acclaimed as an important stylist on his respective instrument, together the trio creates soundscapes and atmospheres that truly evoke their unusual name – “sonoluminescence” is a light produced by sound waves passing through liquid. New York bassist William Parker has toured internationally and appears on over 150 recordings, not only with such musicians as Peter Brotzmann, Jeanne Lee, and Cecil Taylor, but in his own big band and small ensembles. Baritone saxophonist David Mott has been called “the Chopin of the bari sax,” and has been praised in the Toronto Star for his “extraordinary virtuosity,” using circular breathing, multiphonics, and other extended techniques on the baritone saxophone to create a rich tapestry of polyphonic sound. This year’s Something Else! Festival Artist in Residence Jesse Stewart, described as “one of the most innovative musicians in Canada” (Ottawa Jazz Scene), is a percussion virtuoso who has won multiple awards for his work, including a 2012 Juno Award for his work with the Stretch Trio.